Thumbnail Theater: Macbeth features the tale telling hijinks of Michael Mills, a man who knows how to tell a story. He has the awards to prove it. The app filters Macbeth down to a nine-minute animated masterpiece that’s just the right length to captivate the kiddos without overwhelming them. However, that’s just the beginning. The app also holds tons of educational and historical data and really digs deep into the life and time of William Shakespeare, all with a tongue-in-cheek flair that’s just plain hilarious. It also has the actual entire text of Macbeth in it, which is something I just didn’t expect. I did find myself wishing that navigating the self-guided educational section was a bit easier. The kids ended up going back to the main screen and having to re-enter self-guided mode to switch topics, which was a bit annoying. If there was a better trick for this, we didn’t find it. Otherwise, I didn’t hear a single complaint about the app and had an awesome time flipping through it myself as well. 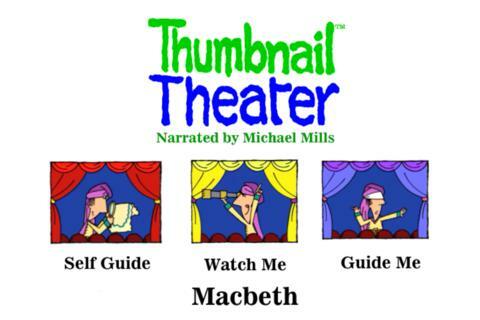 Even with a price tag of $6.99, I think Thumbnail Theater: Macbeth is an awesome find and highly recommend it to any family or Shakespeare lover of any age. Multiple award winning animator, director and producer Michael Mills releases Thumbnail Theater: Macbeth. This wonderfully animated 2D version is and told in Mills’ unforgettable tongue-in-cheek style, that is entertaining, captivating and educational. With encyclopedic elements on one of William Shakespeare’s most beloved plays, this engaging app by Michael Mills gives you insight into the historical Macbeth and the life of the playwright. Full of lively anecdotes on the life and times of the play and its characters, this app with over three hours of interactivity is for everyone, from age 9 to 99 years, to enjoy alone or in an educational setting. British born and educated, Mills has won over a hundred International Awards, an Oscar nomination for ‘Evolution’ and ‘History of the World in Three Minutes flat’, as well as Executive Producer for the Oscar winning ‘Charade’.